I woke up super excited to see some of the most precious and talked about art pieces in the world. As we walked to the Uffizi Gallery, you notice first the scale of the museum — it’s enormous. As soon as we entered the gallery the painted ceilings were one of the things that really amazed me. There are so many of them, especially along the hallways, and they are each different and unique from one another. 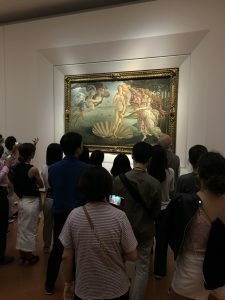 The moment I saw Botticelli’s Primavera and The Birth of Venus I was in absolute awe. As someone who has fully investigated these paintings in full detail, seeing it in person is completely amazing. The scale of these paintings doesn’t even seem possible, and comparing it to viewing it on a projector in Coburn Hall, this experience is extraordinary. 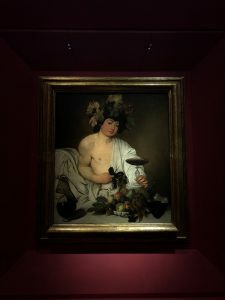 Some of my favorite exhibits were Caravaggio and Da Vinci’s pieces. The way that the red walls of the gallery were painted created an intense feeling that made you feel like one with the Art. I think the Medusa Room was one of my favorite due to how it was set up, with different artists all depicting this figure, in such beautiful different ways. After the gallery, we made a quick stop at the Palazzo Vecchio and made our way to the top of the tower. 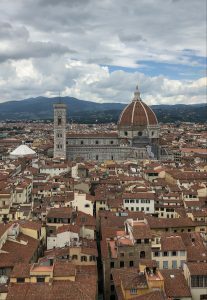 I personally think this view was even more incredible compared to the Bell Tower since it was a view of the river and Ponte Vecchio to one side and Duomo to the other. We headed to the Academia to see our boy, David. I was ready to be underwhelmed and thought that it is all just hyped up. 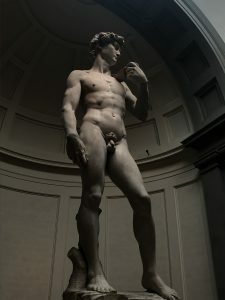 Seeing Michelangelo’s David was a spiritual experience for me as an artist. As soon as we turned the corner, I was completely speechless and amazed. The detail in the fingers, the hair, the feet is so insane to be created out of marble. I have created plaster sculptures and I understand the difficulty that sculpting even is, let alone out of marble at this scale and precision. 17 feet of pure amazing. Going to these galleries as a student, and having learned about so many of these works of art beforehand made seeing them in person extremely rewarding. It’s nice to be able to just turn to someone and so easily talk about a work of art and all the little details and iconography you have previously learned about. Let me just tell you — I love Italy!